For any business, e-mail is the mission-critical communication tool. This greater reliance on e-mail has increased the number of messages sent and received,. Mail servers are not only for e-mail, but also calendars, attachments, contacts, and more. Mail servers such as Exchange servers, need to be up and running all the time. Any outages or performance degradation in the Exchange servers, will affect the mail messaging system. resulting in a bad user–experience and eventually affecting many users. Hence it becomes imperative to monitor and manage those Exchange servers continuously. The Free "ManageEngine Exchange Health Monitor" tool will address this monitoring requirement. 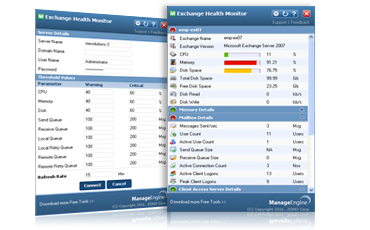 The ManageEngine Exchange Health Monitor tool, as the name implies, monitors important parameters of Exchange 2010 servers,Exchange 2007 servers and Exchange 2003 servers. The tool fetches comprehensive data about the servers and exchange servers details, presents them as visually elegant graphs and reports. The relevant data, graphs and reports are displayed in a desktop tool dashboard providing wealth of information about the real–time functioning of the MS Exchange servers. The "ManageEngine Exchange Health Monitor" tool can monitor Exchange 2010,Exchange 2007 and Exchange 2003 versions. The best part is that the tool is made available, absolutely FREE of cost. The ManageEngine Free Exchange Health Monitor tool serves as a smart desktop tool that continuously monitors Exchange 2010,Exchange 2007 and Exchange 2003 servers, giving real–time monitoring. The tool helps to track Exchange server’s health and ensures your mail server run smoothly.